For people moving to London for the first time, the property hunt is extra-daunting. But Find Properly – the only property portal to help people moving to London – is here with a handy guide! London is full of young people. Nearly 14% of Londoners are aged between 24 and 30. This is higher than the Great Britain average of 10%. But young people in London are not evenly distributed throughout the city. Using the wonders of the National Census, the power of QGIS, and the joys of Google Maps, we plotted the most popular areas for people aged 24 to 30 on a map (below!). The map above shows the areas where more than 20% of residents are aged 24-30. The areas are odd shapes because they follow ward boundaries, but largely make up Clapham, Brixton and Bow. 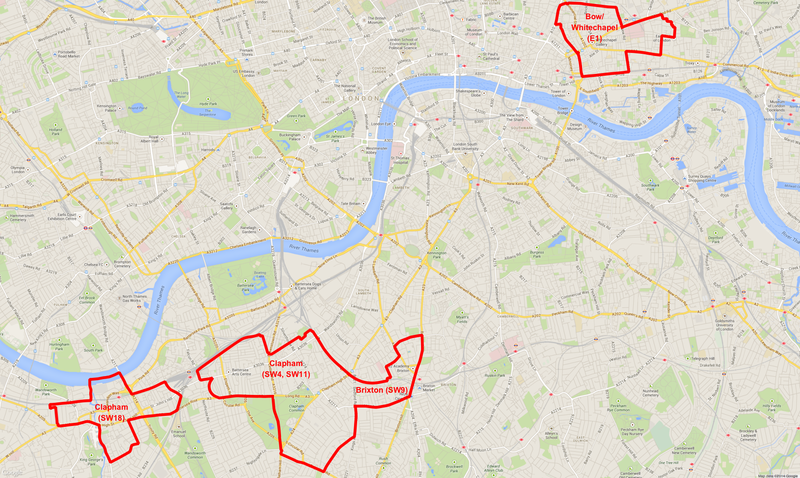 Clapham, Brixton and Bow – what’s the big deal? All 3 areas have fairly good transport connections. If you work west or south of the City (e.g Westminster, London Bridge), Brixton and Clapham are a ~20 minute tube or train ride away. Bow is in between the City and Canary Wharf so is perfect for people who work in these areas. Clapham Junction is the busiest station in the UK (apparently) and has good connections with South England (and Gatwick Airport). Clapham Junction Station – Britain’s busiest station! To check your commute time, use Find Properly. Simply enter your workplace (and your housemates’ if you wish), and we’ll show you the areas with a short commute time. Not sure whether to cycle or use public transport? We can help with this too! Try our handy widget. The three areas all have crime levels slightly above the London average. Don’t panic – London is a safe city, and therefore these areas are not dangerous! As always, standard big-city precautions should be taken. Clutch your Prada handbag tightly, strap down the gold Rolex and don’t leave your iPhone unattended. Both Clapham and Brixton have good nightlife, whilst Bow is near Shoreditch/Dalston/Hoxton which are popular nightspots. We’ve also made a map of the best nightlife and restaurant areas in London. Clapham is blessed with a large common, which tends to get packed on the sunny weekends of the year (yes, both of them). Clapham is also near the river, and so is great for joggers/cyclists. Whilst Brixton and Bow have less greenspace, both have plenty of gyms. And in London, larger parks are usually only a short tube ride away. We wrote a whole blog post about where to live if greenspace is important. Clapham is slightly more expensive than Bow and Brixton, at £180 vs £165. This is the weekly rent of a 3 bed property, shared by 3 people. Generally the larger the property, the cheaper it is per bedroom. Living alone is not a good idea unless you are minted and/or very antisocial. As these prices are the average you will be able to find cheaper (or more expensive) places depending on your budget. Remember to also budget for utilities (approx £50 per month per person) and council tax. Be especially careful in Clapham about council tax. Clapham falls across 2 councils – Lambeth and Wandsworth. Council tax in Wandsworth is significantly lower than in Lambeth (i.e up to £400 a year less). Use the council tax filter in Find Properly to make sure you are in the right area of Clapham! Try to begin your search a month before you plan to move in. You need time to find the right place, and (just as importantly) one that is becoming vacant at the right time. Landlords hate vacant periods so there’s no point starting your search too early. Set up a property alert. Good properties in London get snapped up very quickly, so make sure you’re the first to know. If you are searching with friends, use Find Properly‘s shared list functionality. You can comment on and rate each others’ property choices, on a single shortlist. This will avoid super-long Facebook threads and make organising viewings a bit easier. View as many properties as you can without going mad. This will give you a sense of the area and how much property you get for your money (probably not very much). Or you can contact us via the feedback page on Find Properly. This entry was posted in Moving to London and tagged Bow, Brixton, Clapham, Clapham Common, London, Property, property in London. Bookmark the permalink.